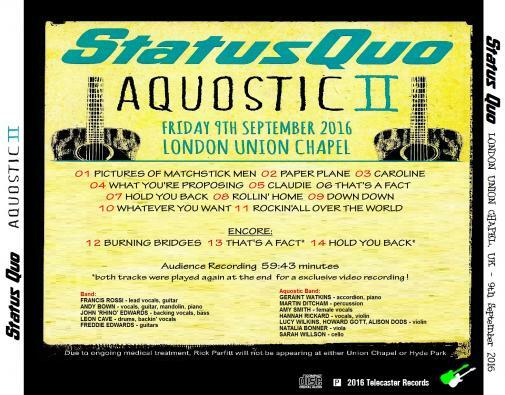 Rick Parfitt not appeared at the 2016 AQUOSTIC shows! Strings (only 2016 shows): Lucy Wilkins - Violin, Howard Gott - Violin, Natalia Bonner - Violin, Alison Dods - Violin, Sophie Sirota - Viola, Sarah Wilson - Cello. Tour Crew: Glen Smith (Tour Manager), Lyane Ngan (Band Personal Assistant), Ewan Cameron (Lightning Director), Andy May (FOH Sound Engineer), Tim Franklin (Monitor Engineer), Lloyd Gilbert (Guitar Tech), Andy Tomkins (Keyboard / Bass Tech), Lance Miles and Darren Alexander (Drum Tech), Danny Stead (Strings Engineer), Musicial Director: Mike Paxman. Merchandiser: Global Merchandising Services Ltd. Management: DurocMedia Ltd. Manager: Simon Porter. Tour Notes: Due to ongoing medical treatment at the time, Rick Parfitt were not appearing at Union Chapel and BBC Hyde Park in 2016. 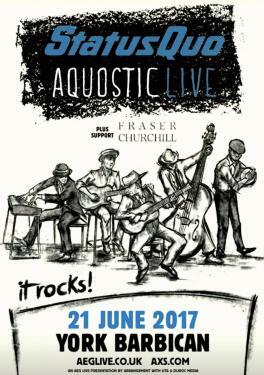 Aquostic Live will be the future for the band after the Last Night of the Electric Tour 2016/2017. 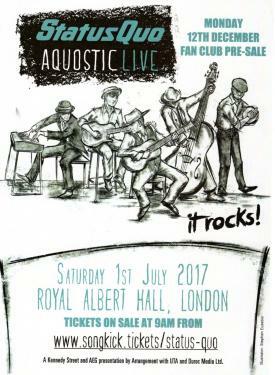 Most of the AQUOSTIC LIVE shows in 2017 are full seated. 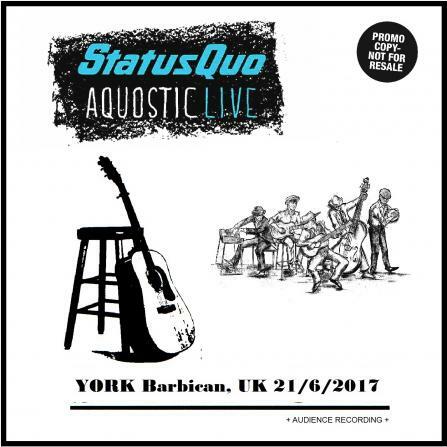 Status Quo have been forced to postpone their gig scheduled for Sunday, 25th June at Norwich due to illness. Francis Rossi has been diagnosed with laryngitis. 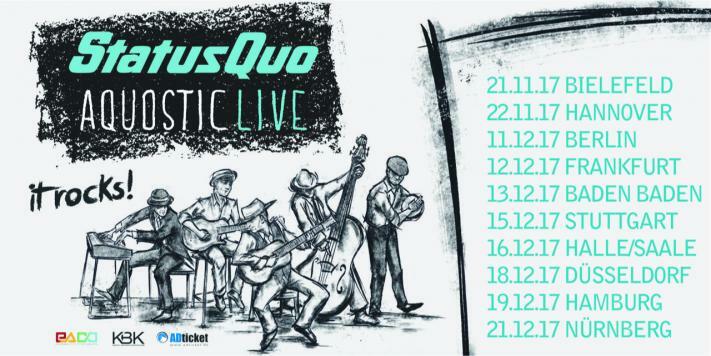 The band plan to rescheduled the show on Thursday, 16th November 2017 - the start of the AQUOSTIC LIVE European Tour. ***The Band and Management have had a change of hearts and they've decided to plug in the electric guitars for the UK shows and renamed it "PLUGGED IN - Live and Rockin' Tour". 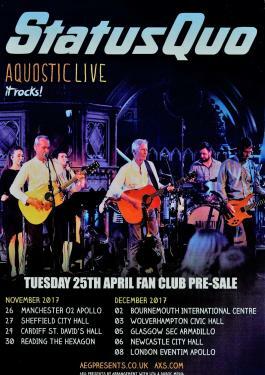 The renamed 2017 UK Winter Tour will now be fully electric, althrough this change applies to AQUOSTIC LIVE UK dates only. 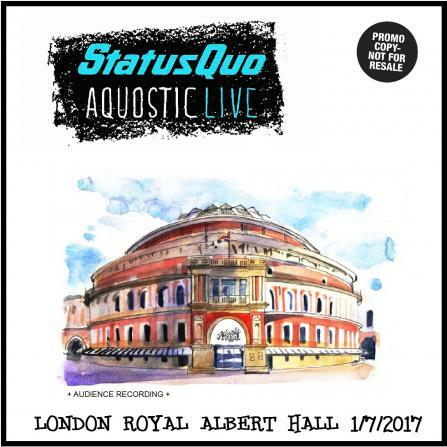 The Band haven't toured the "AQUOSTIC LIVE" show in Europe and promoters have requested that the shows stay in that format. 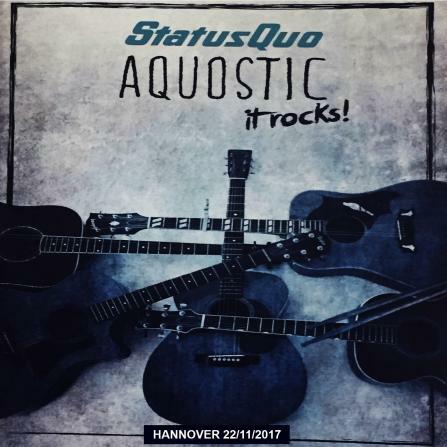 *** "
Further to the cancellation of shows in Berlin, Frankfurt and Baden Baden, the management are forced to announce that the remaining dates on the German Aquostic tour will also be cancelled due to Francis Rossi's ongoing illness. Francis is receiving medical attention in Germany for a severe upper respiratory infection. It was hoped that he would be able to recover enough to perform the rest of the dates of the tour from Friday Dec 15th in Stuttgart but unfortunately that has not been the case. 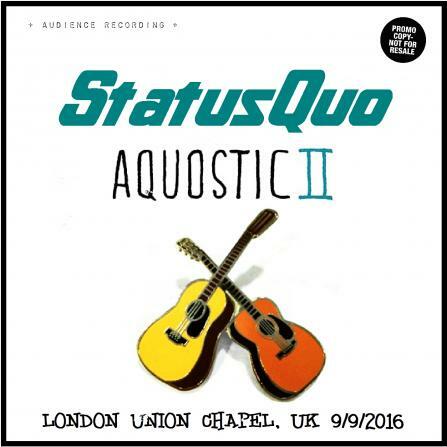 09.09.2016 - On Friday 9th September the band played a exclusive warm up show at the London Union Chapel. The Union Chapel is a beautiful venue, holding around 900 fans. Due to ongoing medical treatment, Rick Parfitt will not be appearing at either Union Chapel or the Hyde Park BBC Radio 2 gig. 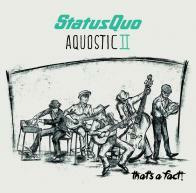 After their 50 Minutes set, the full band played the two new tracks "That's a Fact" and "Hold You Back" from Aquostic 2 once again for recording two videos for promotional use with a live atmosphere. 11.09.2016 - On Sunday 11th September the band played again at the massive London Hyde Park show - BBC Radio 2 - a festival in a day . This time with the full Aquostic sixteen piece line-up. 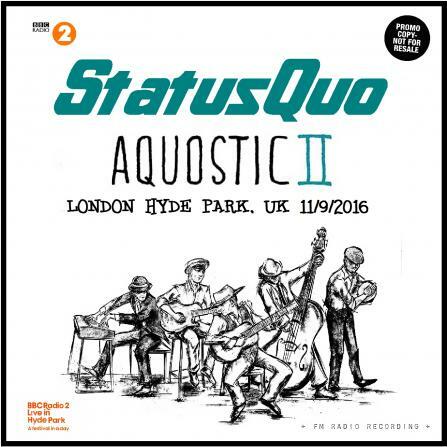 Quo will be on stage at 17.55 h to 18.45 h. Also appearing on the day: Andreya Triana, Jamie Lawson, Travis, LeAnn Rimes, Gregory Porter, Madness and Elton John. BBC Radio 2 will be broadcast the hole day live from Hyde Park. You'll also be able to watch the event live by pressing the Red Button from any TV channel in the UK.